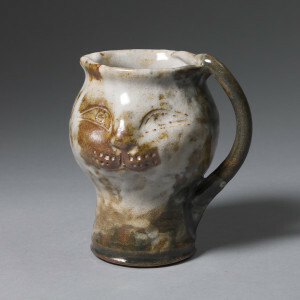 Purchase Siglinda’s unique pottery online because ninety percent of the price of your purchase goes to support the cats and kittens at the Goathouse Refuge. Spaying and neutering are still not exercised enough by the local population, and shelters are ill-equipped to deal with the steady flow of animals coming in. Many shelters kill for space almost on a daily basis, and often do so in inhumane ways. Thankfully, gas chambers are now illegal in the state of North Carolina since 2/14/2015, after 8 years of fighting to shut them down. Those shelters that might offer longer term residency can lack indoor/heated spaces during the winter and, consequently, many of their residents simply freeze to death. It is heart-breaking. The Goathouse attempts to take in as many cats as possible from some of the worst shelters. 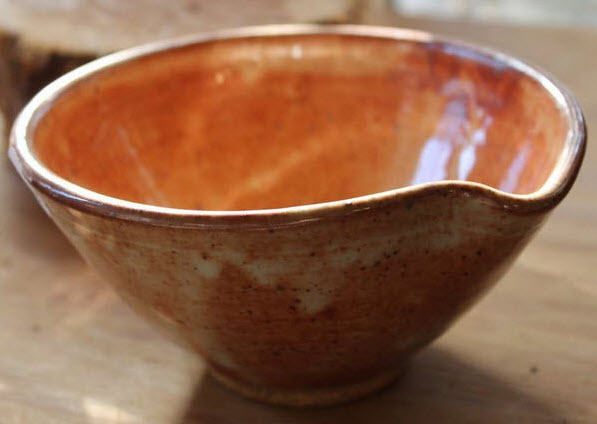 Know that your purchase of Siglinda’s pottery helps to end the pain and suffering of animals in public shelters because we do everything we can within our resources to help cats from one of the many local kill shelters in this area. 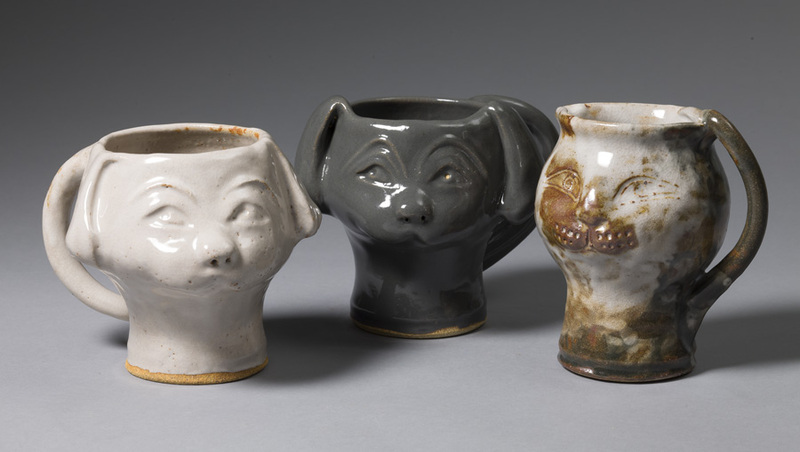 Purchase your unique cat or puppy mug(s) handmade by famed artist Siglinda Scarpa. 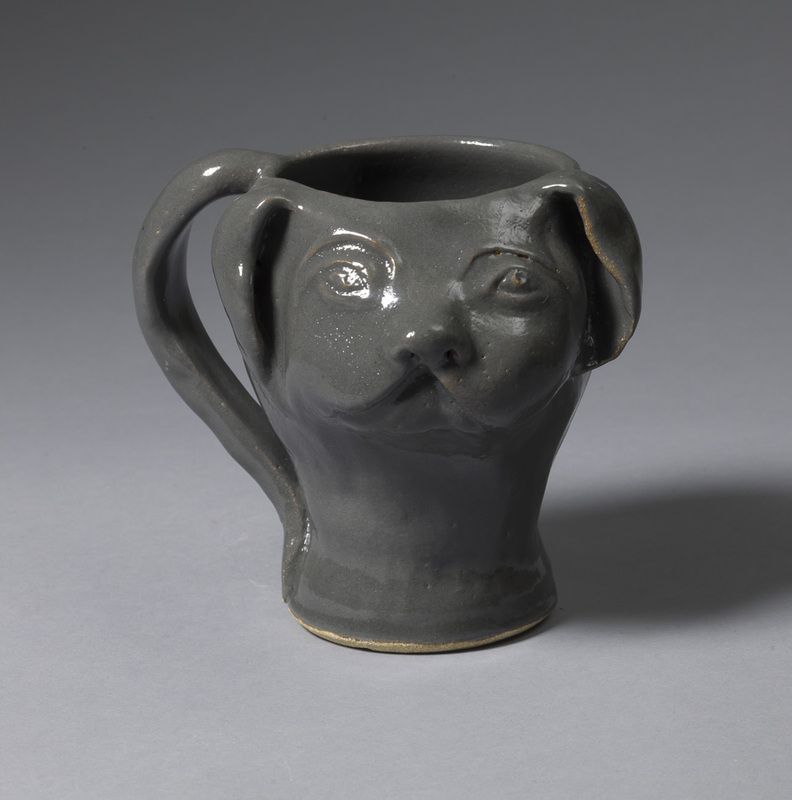 It’s a beautiful rendition of a cat or dog’s face with a tail for the handle. Coming in several colored glazes, it can be both your coffee mug or your milk creamer. 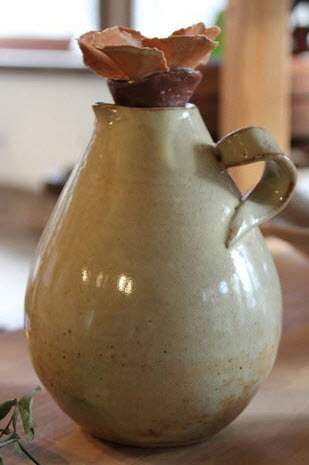 It’s a lovely addition that enhances your coffee experience. Pick your color preference when you buy it buy adding ‘notes to the seller’ on the Paypal purchase page or email our office at siglinda@goathouserefuge.org and we’ll do our best to match that color! Cat Mugs are $55 each and Puppy Mugs are $75 each (plus $17 S&H). 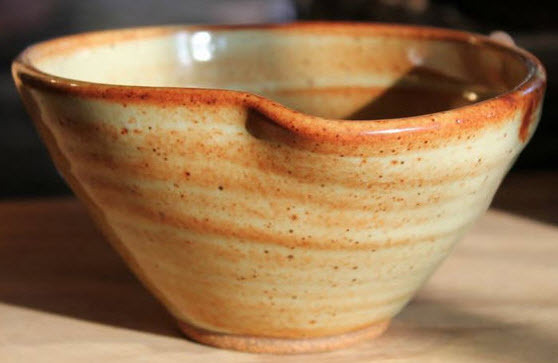 Purchase this beautiful honey pot hand-crafted by Siglinda Scarpa. 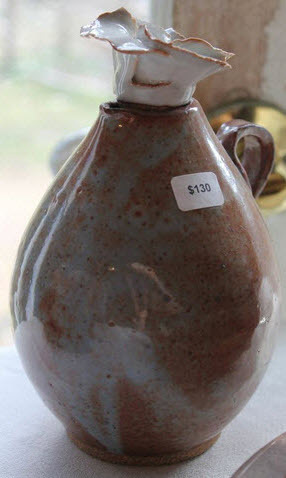 This pot is priced at $130. 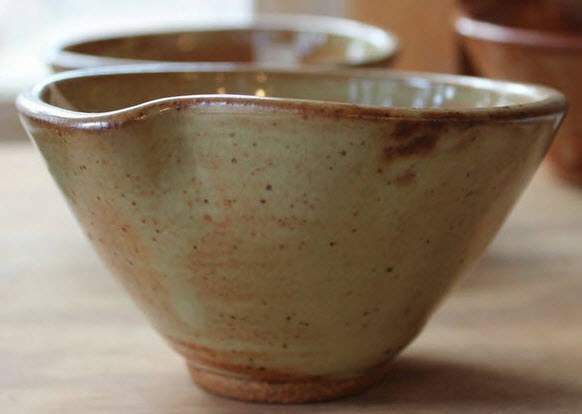 A perfect size for soup, salad or ice cream, these bowls, with their beautiful curved rim, would be the perfect accent piece to your table setting. 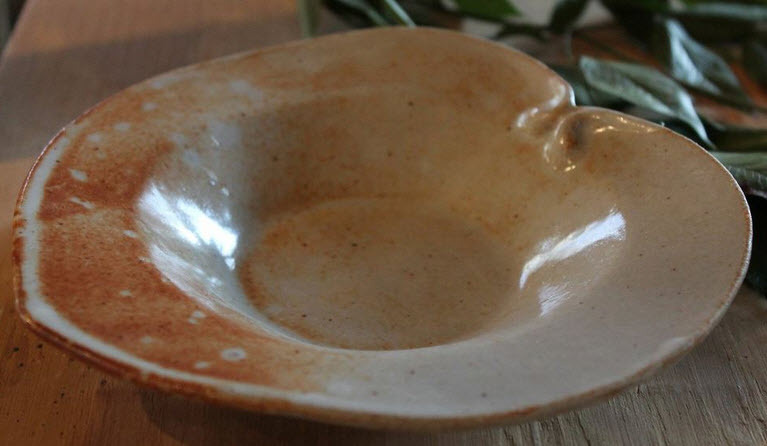 Purchase this beautiful bowl hand-crafted by Siglinda Scarpa. These bowls are priced at $55 each. 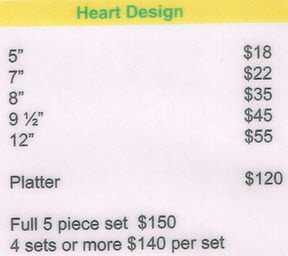 Purchase these unique, special flower design plate sets from the Goathouse Gallery. A set of four is priced at $175. A set consists of 4 plates with one of each size (9, 10.5, 12, and 14 inch). Glazes vary based on the firing but base colors include black, brown, yellow, white, and copper. A set can be all a single color or varying colors. Available colors depend on current inventory. Purchase specially created heart-shaped plates from the Goathouse Gallery. 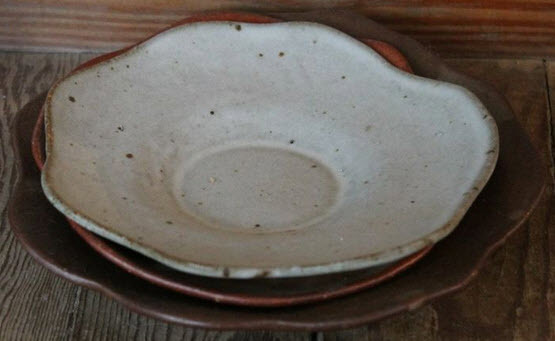 A set of five is priced at $150. 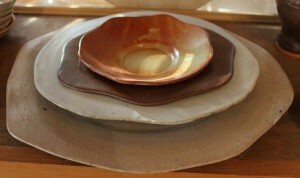 A set consists of 5 plates with one of each size (5, 7, 8, 9.5, 12 inch). 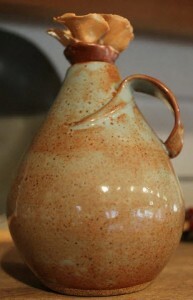 Glazes vary based on the firing but base colors include black, brown, blue, light turquoise, yellow, white, and copper. A set can be all a single color or varying colors. Available colors depend on current inventory. Tell us which colors you want via an email to siglinda@earthlink.net and we’ll do our best to send that color! 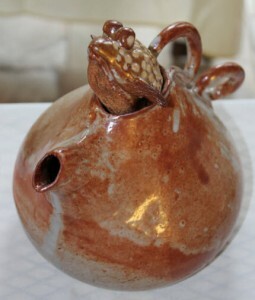 Buy this one of a kind teapot hand-crafted by Siglinda Scarpa. This teapot is priced at $380. 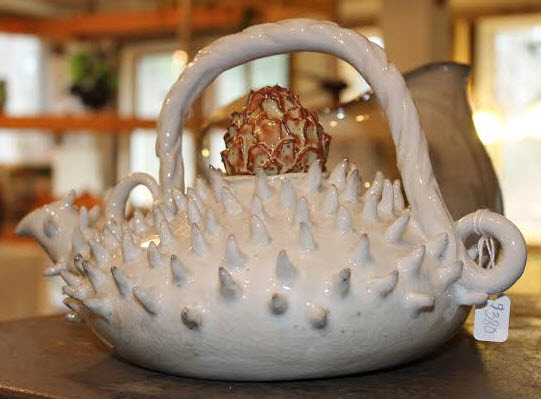 Frangipani is Italian for flower and it is an exquisite flower that makes the lid of this special teapot hand-crafted by Siglinda Scarpa. This teapot is priced at $380. 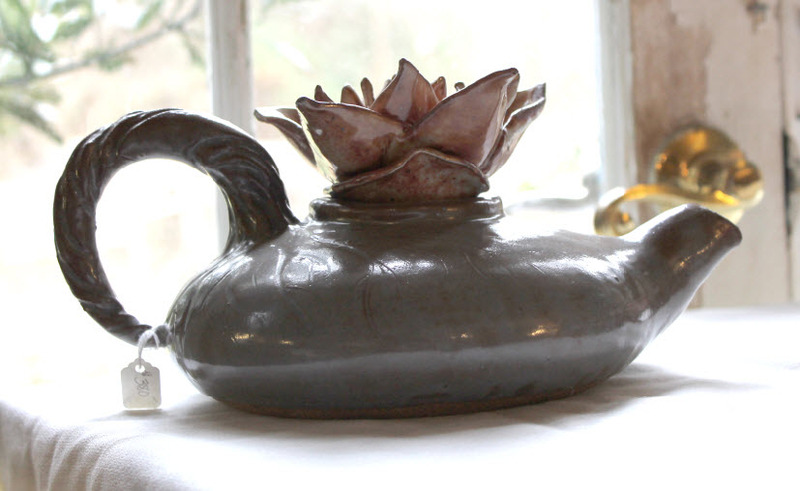 Italian for waterlily, Ninfea aptly describes yet another elegant teapot created by Siglinda. This teapot is priced at $380. 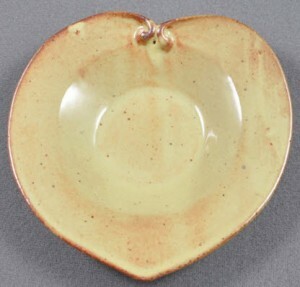 Pod is a striking piece which will be the center of attention in any room or teapot collection. This teapot is priced at $380. Let your imagination run wild with this teapot that appears to have a fish leaping out of your tea! 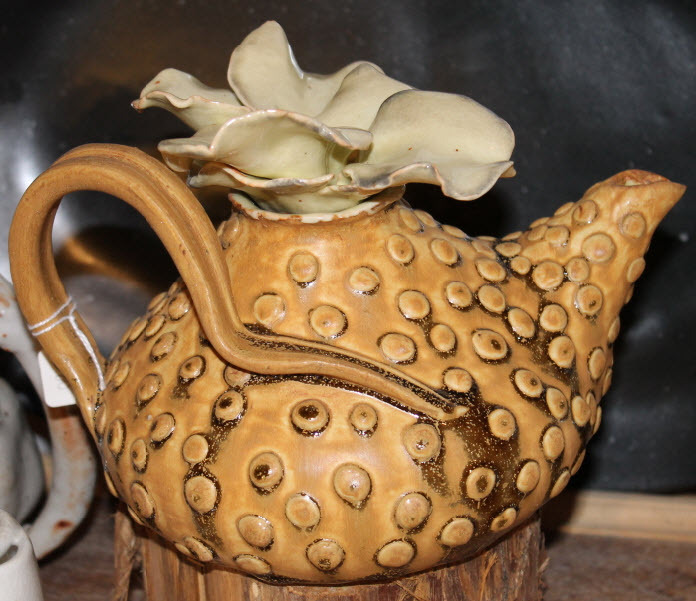 This teapot is hand-crafted by Siglinda Scarpa and is priced at $380. Sit down with a nice glass of wine and simply gaze at this stunning sculpture, can’t you just hear the sea calling? 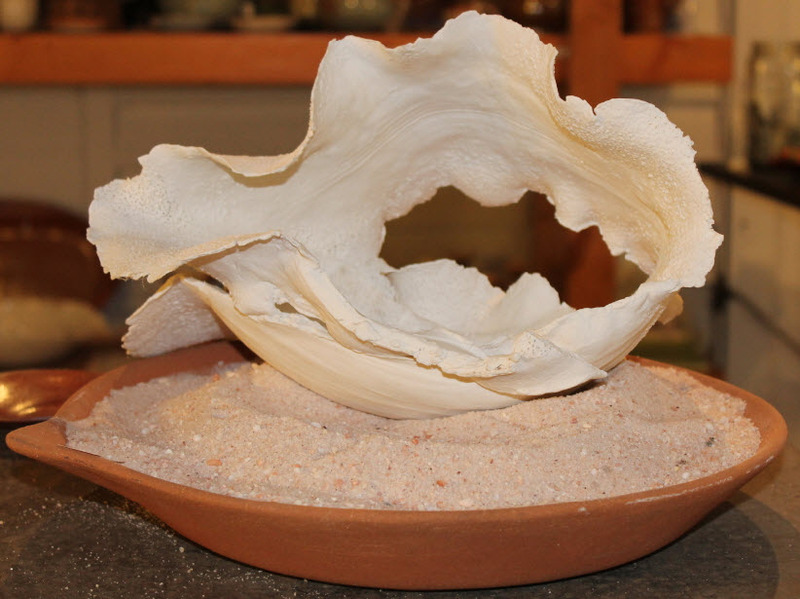 The sea spoke to Siglinda as she created this beautiful piece of art. 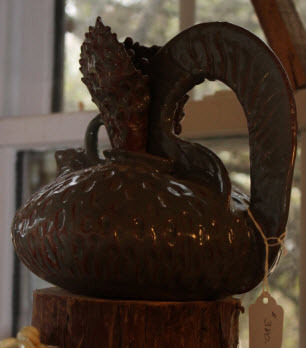 This sculpture is priced at $1,500. 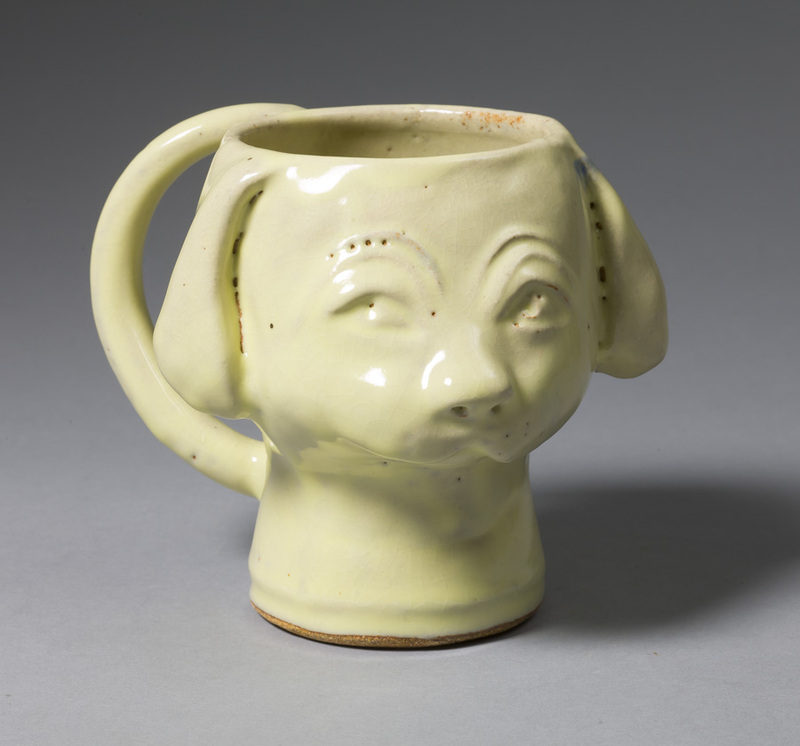 PLEASE NOTE: Paypal purchase price is for the sculpture only. Shipping and NC sales tax will be assessed on top of the purchase price. 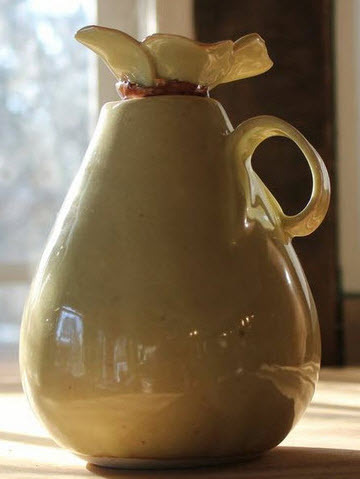 The Goathouse Refuge staff will contact you to pay for shipping and NC taxes (if they apply). The fragility of this sculpture will require unique packing and shipping requirements. 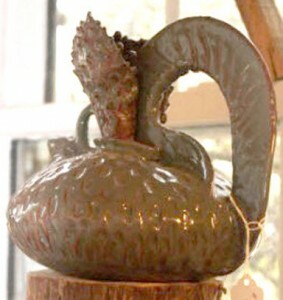 Unique and rare describe this beautiful sculpture by Siglinda Scarpa which tells a story all its own…here it is in her own words…”A few years ago somebody wrote an article about my work and said something that made a lot of sense to me. He said that I make something that does not exist but it could, because I have an intimate relationship with creation. Don’t ask me where it comes from, I don’t know. So the sculpture is something that could exist. 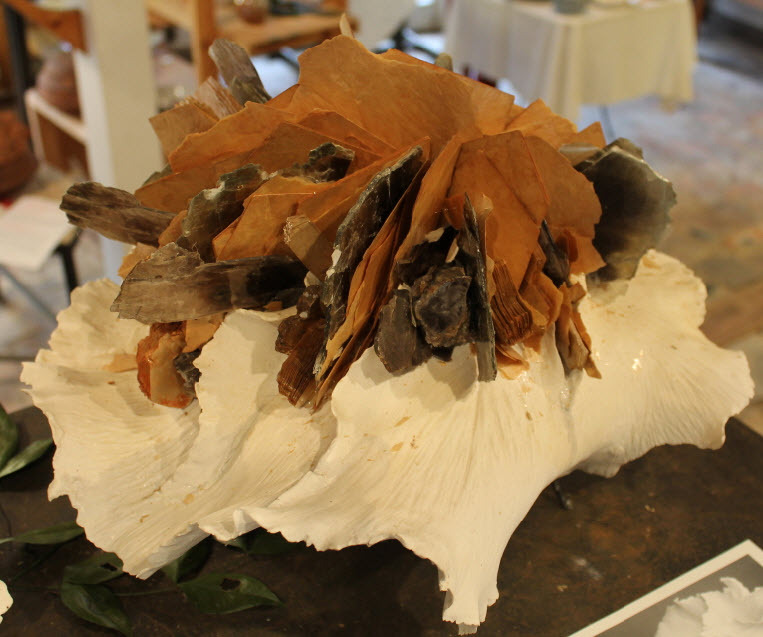 It took me 8 months to find the mica, finally a collector decided to sell to me a box that he had in his basement…one of the things I love about those sculptures is that the mica sheds little fragments all the time and it makes me feel that it is alive.” This sculpture is priced at $7,000.